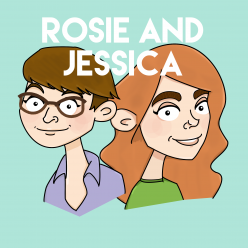 In episode 73, Rosie and Jessica discuss Jessica’s Big Birthday – or Jessica discusses it and Rosie keeps talking about hair dye and fry-ups. As it’s now unbearably cold, they discuss their favourite winter culture, plus the importance of fruit rotation, why cakes need sugar and the repetitive nature of magazines. If you wish to grant us the rights to your one-hit Christmas wonder so we can open a dolly hospital, do get in touch. Jessica picked Bridal Train by The Waifs, while Rosie went for Next of Kin by Alvvays. Rosie has now completely both of these socks and has now cast on a poorly conceived cardigan. We are just in love with the Disney Love Medley! Knitting is good for you so I will just be forced to buy more yarn as a curative, ok?